Woods Mill was once an important flour mill for the surrounding area and records show that a Mill has stood here since the Norman Conquest. Visitors can still see the Victorian waterwheel and Old Miller’s House which now provide a base for our staff. Water still plays a vital part in the wildlife diversity of the site. Water shrews can sometimes be seen swimming from bank to bank, and the elusive water rail can be heard, and sometimes seen, tip toeing along the bank edges. The streams are lined with blackthorn, hawthorn, greengage, willow and other trees, which are alive with birds in the spring and summer: bullfinch, blackcap, garden warbler, willow warbler and chiffchaff each competing to be heard. Nightingales, flying in from Africa during April, overshadow all these birds with their loud melodious song. Hard to see, but their beautiful song resonates throughout the reserve until the middle of June. In the height of summer, listen for the gentle purr of the turtle dove, a summer migrant, which is now increasingly rare following a rapid and sustained population decline. There is no single feature that dominates Woods Mill more than the lake. Yellow and white water-lily pads provide landing platforms for red-eyed damselflies. Indeed the lake is a home for dragonflies of all sorts – brown and southern hawkers, red and ruddy darters, black-tailed skimmers, and even the scarce chaser and downy emerald. Look for the intense metallic sapphire of beautiful demoiselles that contrast with the powder blue of azure damselflies as you walk around the lake and streams. The marginal areas of the lake are fringed with lesser pond-sedge, yellow iris, the curious sweet flag that smells of oranges and the tall stems of reedmace topped with their brown candle-like flowers that will explode into fluff with the arrival of spring. Sitting quietly, the patient observer may catch the lightning blue streak of a kingfisher as it noisily skims across the water surface. Among the scrub and reed beds, Cetti’s and reed warbler announce their territories. The reed warbler has flown from its winter residence in Africa, flying over Spain and France before risking the English Channel to reach its summer breeding grounds. School children enjoy getting to grips with the aquatic wildlife found in our ponds under supervision of our staff and volunteers, netting pond life such as great diving beetles, water boatman and predatory dragonfly nymphs as well as both smooth and palmate newts. Our flood plains and Woods Mill stream with it oxbows and fast flowing water attract the elusive snipe and green sandpiper and if you’re really lucky you might catch a glimpse of brown trout swimming upstream looking for somewhere to spawn. Walking the meadows in the early morning or just before dusk in the summer you might catch sight of the ghostly barn owl gliding silently on outstretched wings in search of field voles. On warm summer days meadow brown, skippers, marbled white and gatekeeper butterflies can be seen competing for nectar and sunlight. The flower heads of meadow foxtail and sweet vernal grass sit with cuckooflower (the food plant of the orange-tip butterfly) precede the purples of knapweed and yellows of meadow vetchling, all creating a patchwork of colour. Once autumn arrives, the hedgerows and wooded shaws surrounding our meadows and streams become important feeding stations for birds and mammals with blackberries, sloes and other fruits important to their winter survival. We ask visitors who like to pick blackberries and other fruits to remember they are a vital food source for our native wildlife. 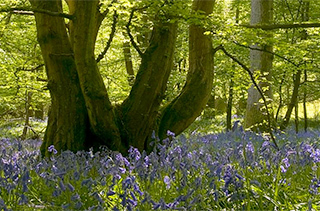 The extensive ancient woodland of oak, coppiced hazel and silver birch provide a canopy for a dazzling display of spring woodland flowers including bluebells, wood anemones, moschatel and common spotted orchids. Honeysuckle provides food for the caterpillars of the white admiral butterflies which gently glide their way through the dappled pathways competing with the silver-washed fritillary. In the canopy of the oak trees, you can see the purple emperor butterfly guarding its territory, often chasing small birds away. While walking in the woodland look for the ancient stones and the green knight slumber­ing in the undergrowth. No one really knows where these carved stones came from but they add an Arthurian feel to the area. The stonework is a great place to look at the many lichens and the bright green mosses that grow in the damp, dappled shade of the woodland. Woods Mill is primarily a reserve for people, a place to see wildlife and to learn about it too. We organise guided walks throughout the year, as well as more formal educational events for adults and children. You can learn about the fungi that abounds in our woodlands in autumn, hear our nightingales singing their hearts out from the middle of a dense thicket in the evening gloom, or hunt for the eerie green glimmer of glow worms on warm summer nights. With full classroom facilities and a rich, varied but compact nature reserve on the doorstep, Woods Mill is the perfect location to both teach and learn about wildlife and nature conservation. It also provides a perfect quiet haven to enjoy an afternoon in the countryside.